On November 6th 2018, a group of performers set up a fake BP “welcoming committee” and Iraqi civilian protest in front of the I am Ashurbanipal: king of the world, king of Assyria exhibition at the British Museum. The performance was timed to coincide with a private exhibition viewing by journalists and VIPs, and the performers stayed for the whole morning talking to journalists, museum visitors and staff. The performers were from the activist theatre group BP or not BP?, and included a number of people of Iraqi heritage. They are calling for an end to BP sponsorship of British Museum exhibitions, and were standing in solidarity with protests in oil-rich Iraq calling for the provision of basic needs. They claim that the British Museum and BP are whitewashing BP’s complicity in the 2003 coalition invasion, using artefacts from modern-day Iraq. Many journalists stopped to talk to or interview the performers, as did museum visitors and staff. According to UK government documents released in 2011, BP were ‘desperate’ to get into Iraq before the 2003 invasion, as it was ‘the big oil prospect’. BP’s centring of its interests within the UK’s invasion plans makes it complicit in a war that has resulted in the deaths of hundreds of thousands of Iraqis and the displacement of millions. The British Museum is facilitating the whitewashing of BP’s actions in Iraq by allowing the company to sponsor of an exhibition that presents it as a benevolent guardian and gatekeeper of Iraqi heritage. BP is delighted to be sponsoring objects from ancient Iraq. Like Ashurbanipal, we’re willing to do whatever it takes to keep control of the region’s wealth and resources. Today, our oilfields in Iraq keep getting more profitable, while Iraqis protest in the streets for basic services. We believe our empire will last for ever. Or at least until the climate change from our oil-driven business plan reaches truly catastrophic levels. The spoof banner display used BP’s logo and fonts and contained the slogans “BP: Making You History” and “Sponsoring the past, destroying the future”. As part of the performance, a group of protesters challenged the BP characters with chants such as ”British Museum, we’ll keep coming back – no BP logos on your stolen artefacts!’ They were met with extraordinarily honest admissions about BP’s activities in Iraq, its contributions to climate change, and the role played by the British Museum in using Iraqi culture and history to cover up BP’s misdeeds. A spokesperson for the group said: “Both the British Museum and BP should be ashamed of this exhibition, and its sponsorship. BP has played a key role in the war and in environmental destruction in Iraq. This has fuelled the social and economic inequality that Iraqis continue to suffer from and protest against. Today’s unsanctioned performance was part of a growing wave of criticism of oil sponsorship of the arts. 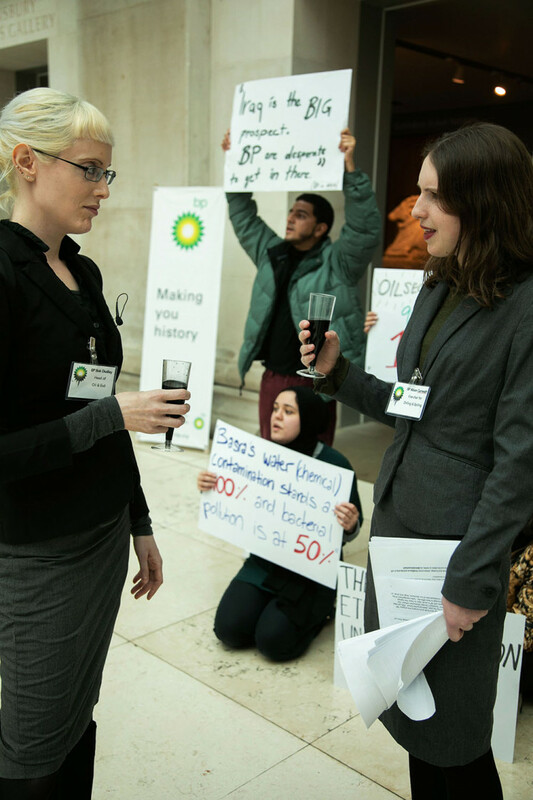 In just the last month, it was revealed that Shell’s sponsorship of the National Gallery had come to an end, while on October 27th a group of performers from BP or not BP? created a pop-up anti-BP exhibition of their own, without permission, inside the British Museum’s I Object exhibition of objects of dissent. BP provides less than 0.5% of the British Museum’s annual income. This is BP or not BP?’s 52nd performance protest, and the group’s 33rd performance in the British Museum. BP or not BP? is a member of the Art Not Oil coalition.